This is common in all age groups and can be caused by conditions such as plantar fasciitis or heel spur syndrome. Pain is often at the base of the heel, pain is felt when standing up after an extended period of time especially first thing in the morning. Sometimes there is also burning and tightness in the arch of the foot. 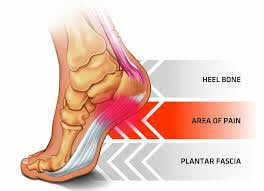 This refers to inflammation or swelling of the plantar fascia, a band of tissue which connects the base of the foot to the heel. The ligament or plantar fascia if irritated can become inflamed and cause swelling to the heel area and mid foot. Wearing unsupportive shoes, especially when standing or walking on hard, flat surfaces, can also strain the fascia and cause discomfort. Heel Spurs are bony deposits that develops over time into a sharp bony growth under the heel. These bony outgrowths are often present where there is a plantar fasciitis too. This gives the condition the other name of heel spur syndrome.